ESG4Real is a non-profit and politically independent initiative with the main purpose to promote growth and development within responsible investments (RI) by establishing a quality assured minimum level within RI. This minimum level is quality assured through independent certification of asset managers, with the aim to ensure that asset owners’ capital is invested responsibly. Our goal is to gather asset owners and asset managers behind a new standard for RI and influence investors to use opportunities and improve risk management related to ESG (Environment (E), Social (S) and Governance (G)). 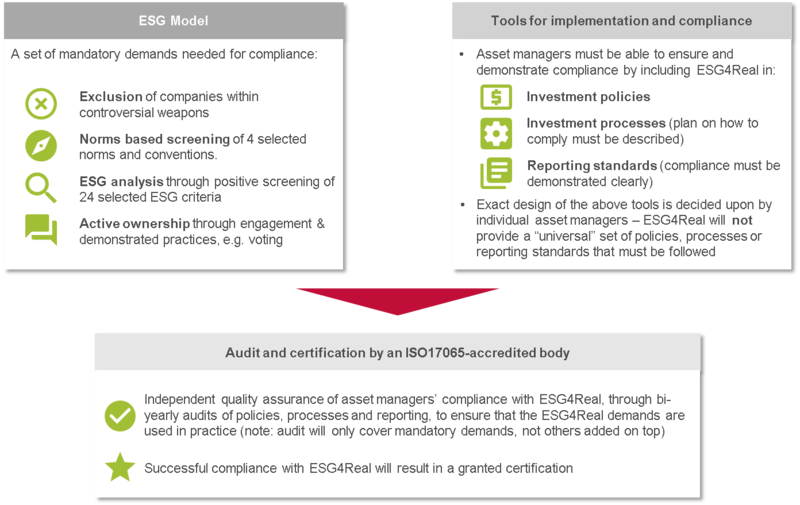 Establish a minimum level of requirements within RI to improve communication and transparency and increase competence sharing between asset owners and asset managers and contribute to a more balanced analysis of E, S and G.
The ESG4Real Standard contains a set of basic demands within RI, including exclusions, norms, conventions, ESG criteria and engagement that asset managers shall comply with. If desired, investors can add further demands upon the minimum level (however not subject for certification). The standard and certification methodology is accepted by Swedac according to ISO17065..
ESG4Real is applicable for listed equities, corporate bonds and active and enhanced indexing investment strategies. Other asset classes and pure index strategies are initially out of scope, but the scope may be extended in the future.